Two α-MnO2 crystals with caddice-clew-like and urchin-like morphologies are prepared by the hydrothermal method, and their structure and electrochemical performance are characterized by scanning electron microscope (SEM), X-ray diffraction (XRD), galvanostatic cell cycling, cyclic voltammetry, and electrochemical impedance spectroscopy (EIS). The morphology of the MnO2 prepared under acidic condition is urchin-like, while the one prepared under neutral condition is caddice-clew-like. The identical crystalline phase of MnO2 crystals is essential to evaluate the relationship between electrochemical performances and morphologies for lithium-ion battery application. In this study, urchin-like α-MnO2 crystals with compact structure have better electrochemical performance due to the higher specific capacity and lower impedance. We find that the relationship between electrochemical performance and morphology is different when MnO2 material used as electrochemical supercapacitor or as anode of lithium-ion battery. For lithium-ion battery application, urchin-like MnO2 material has better electrochemical performance. Manganese dioxides with diverse crystal morphologies are attracting a lot of attention because of their physical and chemical properties and wide applications in catalysis , biosensors , water treatment [3, 4], electrochemical supercapacitors [5–9], and so on. Up to now, various MnO2 crystals with different morphologies such as nanosphere [10, 11], nanorod [12, 13], nanowire , nanoflower [13, 14], nanotube , pillow-shape , urchin-like [10, 16], hollow nanosphere, hollow nanocube , and hollow cone  have been synthesized. MnO2 crystals were already used in water treatment, gas sensors, electrochemical supercapacitors, and so on. For example, hollow spherical and cubic MnO2 nanostructures prepared by Kirkendall effect showed good ability to remove organic pollutants in waste water . Cao et al. had prepared pillow-shaped MnO2 crystals which could remove about 85% of the Cd2+ in waste water . Zhang et al. had prepared MnO2 hollow nanospheres and nanowires used for ammonia gas sensor . MnO2 hollow nanospheres were found to exhibit enhanced sensing performance to ammonia gas at room temperature compared with MnO2 nanowires. Ma et al. had prepared urchin-shaped MnO2 and clew-like-shaped MnO2 used for electrochemical supercapacitors . They found the electrochemical performances differed with various morphologies, and clew-like MnO2 nanospheres had higher capacitance and lower charge-transfer resistance due to their incompact structure. However, the application researches of MnO2 as anode for lithium-ion battery were relatively few. MnO2 nanomaterials are recognized as anode materials since three-dimensional (3d) transition metal oxides (MO, where M is Fe, Co, Ni, and Cu) were proposed to serve as high theoretic capacity anodes for lithium-ion battery by Poizot et al. . Before that, MnO2 nanomaterials were usually used to prepare LiMn2O4 crystals as cathode for lithium-ion battery [19, 20]. Chen's research group has made great contributions on the research of anode for lithium-ion battery [21, 22]. Nevertheless, compared to the intensive investigation on Fe2O3, Fe3O4, SnO2, CoO, and so on [23–28], the application investigation of MnO2 nanomaterials on anodes for lithium-ion battery is still immature, although the investigations on their preparation are plentiful. The research on MnO2 anode is relatively complex because MnO2 exists in several crystallographic forms such as α-, β-, γ-, and δ-type. For example, Zhao et al. reported γ-MnO2 crystals with hollow interior had high discharge capacity as 602.1 mAh g−1 after 20 cycles. Li et al. 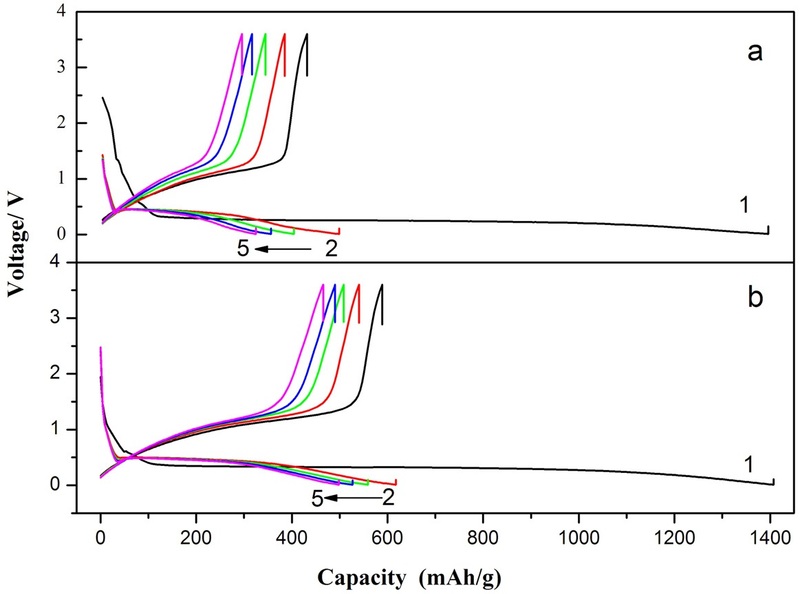 found α-MnO2 with nanotube morphology exhibited high reversible capacity of 512 mAh g−1 at a high current density of 800 mA g−1 after 300 cycles. Thus, from the above two examples, we could summarize that the electrochemical performance of MnO2 crystals has relationship both with the crystallographic forms and with the morphologies. Therefore, the researches on the relationship of electrochemical performance with the morphologies and the relationship of electrochemical performance with the crystallographic forms are very essential. In the present work, to enrich the relationship between electrochemical performances and morphologies, two α-MnO2 crystals with caddice-clew-like and urchin-like morphologies were prepared by hydrothermal method. For lithium-ion battery application, urchin-like α-MnO2 crystal with compact structure was found to have better electrochemical performance. All reagents purchased from the Shanghai Chemical Company (Shanghai, China) were of analytical grade and used without further purification. The MnO2 micromaterials were prepared using the similar method described by Yu et al. with some modifications. To prepare caddice-clew-like MnO2 micromaterial, 1.70 g MnSO4 · H2O was dissolved in 15-mL distilled water with vigorous stirring. When the solution was clear, 20-mL aqueous solution containing 2.72 g K2S2O8 was added to the above solution under continuous stirring. Then, the resulting transparent solution was transferred into a Teflon-lined stainless steel autoclave (50 mL) of 80% capacity of the total volume. The autoclave was sealed and maintained at 110°C for 6 h. After the reaction was completed, the autoclave was allowed to cool to room temperature naturally. The solid black precipitate was filtered, washed several times with distilled water to remove impurities, and then dried at 80°C in air for 3 h. The obtained caddice-clew-like MnO2 micromaterial was collected for the following characterization. 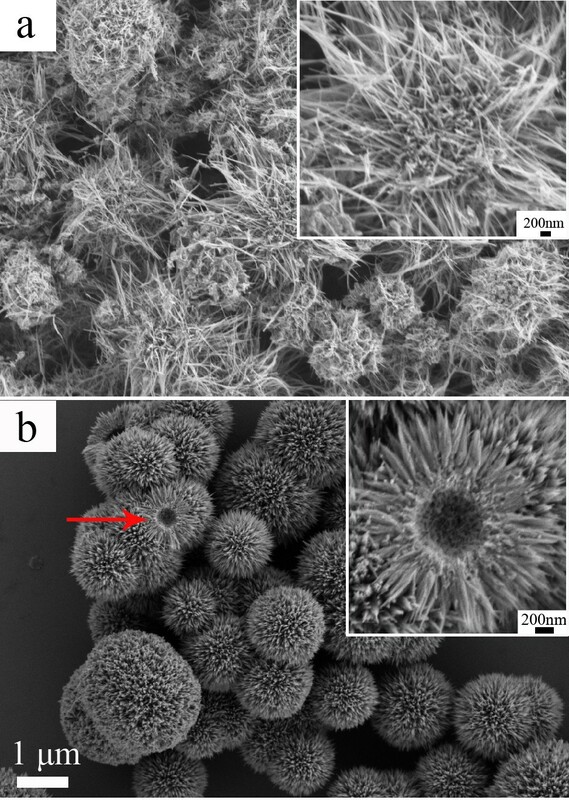 Urchin-like MnO2 micromaterial was prepared by the similar method, while after adding 1.70 g MnSO4 · H2O and 2.72 g K2S2O8 into 35-mL distilled water, 2 mL H2SO4 was then added. Subsequently, the solution was transferred into a Teflon-lined stainless steel autoclave (50 mL), and the autoclave was sealed and maintained at 110°C for 6 h as well. After the reaction was completed, the autoclave was allowed to cool to room temperature naturally. The solid black precipitate was filtered, washed several times with distilled water to remove impurities, and then dried at 80°C in air for 3 h.
The crystallographic structures of the products were determined with X-ray diffraction (XRD) which were recorded on a Rigaku D/max-2200/PC (Rigaku, Beijing, China) with Cu target at a scanning rate of 7°/min with 2θ ranging from 10° to 70°. The morphological investigations of scanning electron microscope (SEM) images were taken on a field emission scanning electron microscope (FESEM; Zeiss Ultra, Oberkochen, Germany). Electrochemical performances of the samples were measured using CR2025 coin-type cells assembled in a dry argon-filled glove box. To fabricate the working electrode, a slurry consisting of 60 wt.% active materials, 10 wt.% acetylene black, and 30 wt.% polyvinylidene fluoride (PVDF) dissolved in N-methyl pyrrolidinone was casted on a copper foil and dried at 80°C under vacuum for 5 h. Lithium sheet was served as counter and reference electrode, while a Celgard 2320 membrane (Shenzhen, China) was employed as a separator. The electrolyte was a solution of 1 M LiPF6 in ethylene carbonate (EC)-1,2-dimethyl carbonate (DMC) (1:1 in volume). Galvanostatical charge-discharge experiments were performed by Land electric test system CT2001A (Wuhan LAND Electronics Co., Ltd., Wuhan, China) at a current density of 0.2 C between 0.01 and 3.60 V (versus Li/Li+). Cyclic voltammogram (CV) tests were carried out on an electrochemical workstation (CHI604D, Chenhua, Shanghai, China) from 0.01 to 3.60 V (versus Li/Li+). Electrochemical impedance spectroscopy (EIS) measurements were performed on an electrochemical workstation (CHI604D, Chenhua, Shanghai, China), and the frequency ranged from 0.1 Hz to 100 kHz with an applied alternating current (AC) signal amplitude of 5 mV. SEM images of MnO 2 samples obtained under (a) neutral and (b) acidic conditions. The scale bar is 1 μm. The inset shows the enlarged SEM image of MnO2 sample and the scale bar is 200 nm. The formation procedure of the MnO 2 micromaterials. (a) Caddice-clew-like and (b) urchin-like MnO2 samples. As can be seen in Reaction (1), the reaction rate is pH dependent. Therefore, sulfuric acid is added to decrease the reaction rate, and the morphology can be modulated. When no sulfuric acid is used, these primary nanoparticles form quickly (shown in Figure 2(a)). Then, the tiny nanoparticles spontaneously aggregate into long nanowires. With minimizing interfacial energies, the nanowires wrap with each other incompactly to form caddice-clew-shaped MnO2 micromaterials. When sulfuric acid is added as morphology modulation agent, the nucleation process in Reaction (1) is suppressed. In this situation, it is not easy to form nanowires. Alternatively, short nanorods are formed (shown in Figure 2(b)). With minimizing interfacial energies, the nanorods self-assemble compactly to urchin morphology with a hollow interior. Thus, urchin-like MnO2 micromaterials are prepared. Therefore, sulfuric acid plays a crucial role in the morphology evolution due to its control of the nucleation rate of MnO2. The XRD patterns of the MnO2 micromaterials are shown in Figure 3. As shown, the two samples had similar crystallographic structure. The diffraction peaks which appeared at 2θ = 12.7°, 18.1°, 28.8°, 37.5°, 42.1°, 49.9°, 56.2°, and 60.3° matched well with the diffraction peaks of (110),(200),(310),(211),(301),(411),(600), and (521) crystal planes of α-MnO2 standard data (JCPDS card PDF file no. 44-0141). Therefore, the two MnO2 micromaterials prepared by hydrothermal method were both α-MnO2, which was essential to evaluate the relationship between electrochemical performances and morphologies of MnO2 crystals as anodes for lithium-ion battery. As calculated, the lattice parameters of caddice-clew-like MnO2 are a = 9.7875 and c = 2.8600, which are highly identical to the standard values (JCPDS card PDF file no. 44-0141, a = 9.7847, c = 2.863). The cell volume of caddice-clew-like MnO2 is 273.97 Å3 which is also highly identical to the standard values (274.1 Å3),while the lattice parameters of urchin-like MnO2 are a = 9.8084 and c = 2.8483. According to the standard values, the crystal cell expands in a and b directions and contracts in c direction. The cell volume of urchin-like MnO2 is 274.02 Å3. The average size of the caddice-clew-like MnO2 crystal grains is calculated to be 32 nm according to the Scherrer equation D = Kλ/β cosθ using the strongest diffraction peak of (211) [D is crystal grain size (nm), K is the Scherrer constant (0.89), λ is the X-ray wavelength (0.154056 nm) for Cu Kα, β is the full width at half maximum (FWHM) of the peak (211), and θ is the angle of diffraction peak],while the measured diameter of caddice-clew-like MnO2 is 53 nm. The average size of the urchin-like MnO2 crystal grains is calculated to be 51 nm according to the Scherrer equation. The measured diameter of the short nanorods on urchin-like MnO2 is about 50 nm. As can be seen, the calculated crystallite size value of caddice-clew-like MnO2 crystal is a little smaller than the measured value, but the calculated crystallite size value of urchin-like MnO2 crystal is identical. Although the MnO2 micromaterials are in micrometer scale, they are confirmed to assemble by nanomaterials. Consequently, although the two MnO2 micromaterials are with identical crystal structure, they may have some difference in the electrochemical performance as the urchin-like MnO2 has the expanded lattice parameters. The XRD patterns of MnO 2 materials. (a) Caddice-clew-like and (b) urchin-like MnO2 samples. Figure 4 presents the typical charge-discharge voltage curves of the anodes (compared to the full battery) constructed from MnO2 micromaterials at 0.2 C rate in the voltage range of 0.01 to 3.60 V (vs. Li/Li+). For clarity, only selected cycles are shown. As shown, the two α-MnO2 micromaterials both have high initial discharge specific capacity as approximately 1,400 mAh g−1, while the theoretical discharge specific capacity is 1,232 mAh g−1. 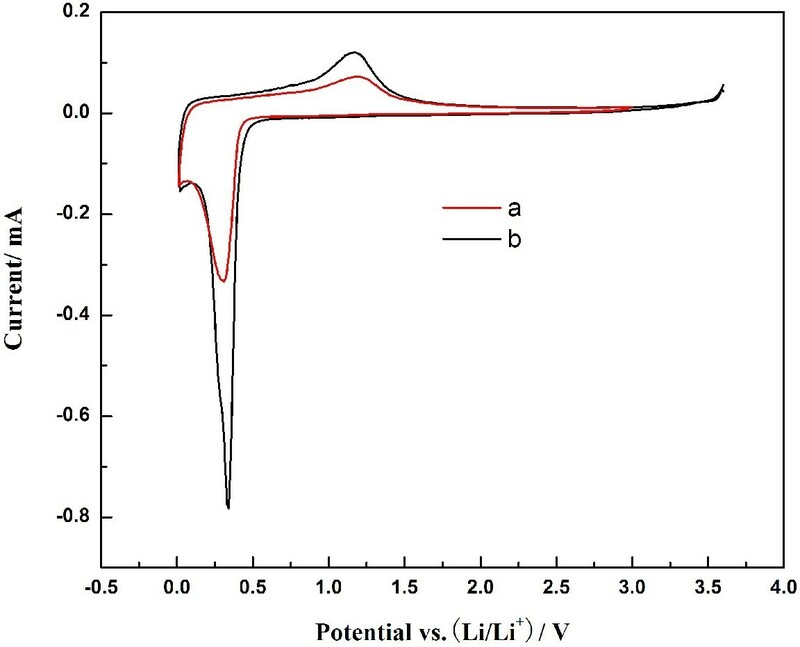 The extra discharge specific capacities of the as-prepared MnO2 micromaterials may result from the formation of solid electrolyte interface (SEI) layer which is known as a gel-like layer, containing ethylene oxide-based oligomers, LiF, Li2CO3, and lithium alkyl carbonate (ROCO2Li), during the first discharging process . The discharge specific capacities of the as-prepared MnO2 micromaterials in the second cycle are 500 mAh g−1(caddice-clew-like MnO2) and 600 mAh g−1 (urchin-like MnO2), respectively. There is an attenuation compared to the initial discharge capacity. After the fifth cycling, the discharge specific capacities of the as-prepared MnO2 micromaterials are 356 mAh g−1 (caddice-clew-like MnO2) and 465 mAh g−1 (urchin-like MnO2), respectively. In the repeated charge-discharge cycling, the discharge specific capacity eventually decays to about 250 mAh g−1. Here, the large capacity loss may come from two facts: one is the capacity loss from the incomplete decomposition of SEI film, which happens in all 3d transition metal oxides including CuO, NiO, and Co3O4; the other one is capacity loss caused by the electrode pulverization and loss of inter-particle contact or the particle with copper foil collector due to large volume expansion/contraction during repeated charging-discharging processes and severe particle aggregation, which is common in all transition metal oxides . In fact, both the MnO2 micromaterials suffer from poor cycling stability of the discharge specific capacity. As usual, one effective way to mitigate the problem is to fabricate a hollow structure, as a hollow interior could provide extra free space for alleviating the structural strain and accommodating the large volume variation associated with repeated Li+ ion insertion/extraction processes, giving rise to improved cycling stability. However, the urchin-like MnO2 in this research indeed has a hollow interior but poor cycling stability. So, another effective strategy to improve the cycling stability is the need for the as-prepared MnO2 samples. For example, shell coating such as carbon coating, polypyrrole coating, and polyaniline coating is widely used to improve the cycling stability. Wan et al. prepared Fe3O4/porous carbon-multiwalled carbon nanotubes composite to promote cycle performance. Their excellent electrical properties can be attributed to the porous carbon framework structure, which provided space for the change in Fe3O4 volume during cycling and shortens the lithium ion diffusion distance . Therefore, we are preparing polypyrrole coating MnO2 micromaterials to enhance the cycling stability. Charge-discharge specific capacity-voltage curves of MnO 2 anode materials in the potential range of 0.01 ~ 3.60 V at 0.2 C. (a) Caddice-clew-like and (b) urchin-like MnO2 samples. In addition, a discharge plateau with wide and flat shape appears in all the discharge voltage curves. Urchin-like MnO2 micromaterial has a plateau at about 0.32 V from 120 to 1,100 mAh g−1 during the first discharging process and has a plateau from 50 to 360 mAh g−1 in the second cycling. The caddice-clew-like MnO2 micromaterial has similar discharge plateau. The discharge plateau may bring stable discharge current to the battery prepared by MnO2 micromaterials. According to the results of discharge specific capacity, urchin-like MnO2 micromaterial was better than caddice-clew-like MnO2 micromaterial. Cyclic voltammograms of MnO 2 materials. After five charging-discharging cycles measured at a scan rate of 0.05 mV s−1in the potential range of 0.01 ~ 3.60 V. (a) Caddice-clew-like and (b) urchin-like MnO2 samples. The current intensity of oxidation peak is much lower than that of reduction peak. The current intensity of reduction peak and oxidation peak for the urchin-like MnO2 material is 0.7828 and 0.1202 mA mg−1, respectively. 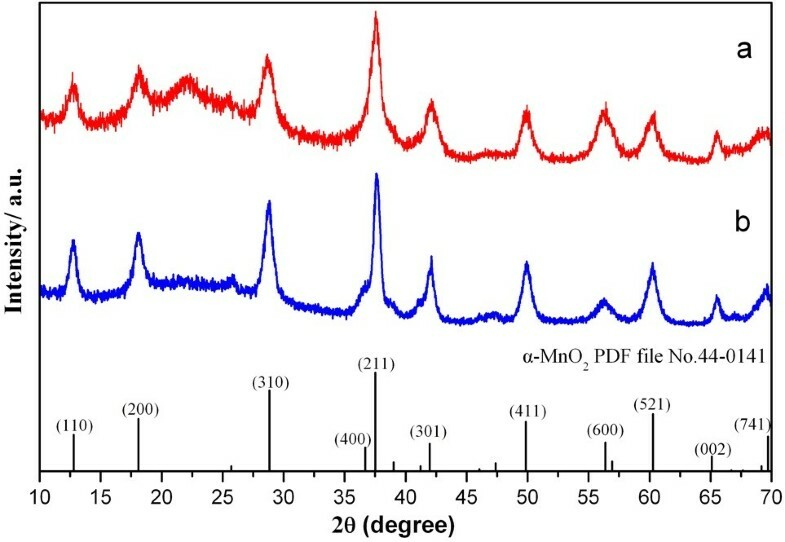 The current intensity attenuation of oxidation peak indicates that Mn element could not completely convert to MnO2 during the charging process. The shapes of the CV curves for the MnO2 samples are similar, while urchin-like MnO2 material has higher peak intensity. The current intensity of reduction peak and oxidation peak for the caddice-clew-like MnO2 material is 0.3333 and 0.0712 mA mg−1, respectively. The asymmetry cyclic voltammogram curves in Figure 5 indicate that the discharging/charging process is irreversible. To exclude the influence of the MnO2 micromaterial density on the electrode, we have normalized the CV curve in Figure 5. According to the results of galvanostatical charge-discharge experiments and CV tests, the urchin-like MnO2 micromaterial is more superior than caddice-clew-like MnO2 micromaterial. We presume the difference on electrochemical performance results from the morphology as both the MnO2 micromaterials have identical crystalline phase. Theoretically, nanomaterials with incompact structure are beneficial to improve the transmission rate and transfer ability of lithium ion. However, the discharge cycling stability of caddice-clew-like MnO2 micromaterial is poor. We guess the incompact structure may lead to easy electrode pulverization and loss of inter-particle contact during the repeated charging-discharging processes. A hollow structure which is another effective strategy to improve the cycling stability could provide extra free space for alleviating the structural strain and accommodating the large volume variation associated with repeated Li+ insertion/extraction processes. So, the relatively better discharge cycling stability may result from the hollow structure. In addition, the surface of urchin-like MnO2 is an arrangement of compact needle-like nanorods, which could improve the transmission rate and transfer ability of lithium ion. Therefore, the electrochemical performances of the MnO2 micromaterials indeed have relationship on their morphologies. The results suggest that the urchin-like MnO2 micromaterial is more promising for the anode of lithium-ion battery. Compared to the literature , when MnO2 materials were used for electrochemical supercapacitors, caddice-clew-like MnO2 material had higher specific capacitance of 120 F g−1 and lower charge-transfer resistance, while the specific capacitance of urchin-like MnO2 material was about 48 F g−1. Moreover, they found the unique capacitance of caddice-clew-like MnO2 was mainly due to the incompact structure. Therefore, the relationship between electrochemical performance and morphology is different when MnO2 material is used as electrochemical supercapacitor or as anode of lithium-ion battery. For the application on lithium-ion battery, urchin-like MnO2 material is better. In order to gain further understanding of the differences in the electrochemical performances, EIS testing was carried out. Figure 6 presents the EIS results for lithium cells after the fifth cycle at open circuit voltage. As shown in Figure 5(a), the impedance spectra of caddice-clew-like MnO2 consist of two oblate semicircles in high-to-medium frequency region and an inclined line in low-frequency region, while the two semicircles of urchin-like MnO2 are not easily distinguishable. The impedance spectra reflect several processes that take place in a series: Li migration through surface films, charge transfer, solid-state diffusion, and finally, accumulation of Li in the bulk of the active mass. An intercept at the Zreal axis in high-frequency region corresponds to the ohmic electrolyte resistance (Rs). The first semicircle in the high frequency ascribes to the Li-ion migration resistance (Rsf) through the SEI films. The second semicircle in the high-to-medium frequency ascribes to the charge transfer resistance (Rct). The inclined line at low-frequency region represents the Warburg impedance (Ws), which is associated with lithium-ion diffusion in the active material [32, 33]. Nyquist plot of Li/MnO 2 cells after five charging and discharging cycles at open circuit voltage. The frequency ranged from 0.1 Hz to 100 kHz with an applied AC signal amplitude of 5 mV. (a) Caddice-clew-like and (b) urchin-like MnO2 samples. Symbols represent experimental data and lines represent fitted spectra using equivalent circuit. The inset is the equivalent circuit. The parameters of impedance spectra were simulated by ZSimpWin software, and the spectra had been fitted with an equivalent circuit shown in the inset of Figure 6. In the equivalent circuit of EIS, apart from the Rs, Rsf, Rct, and Ws, the corresponding constant phase element (CPE) is used instead of pure capacitance due to the non-ideal nature of the electrode. The values of Rsf and Rct calculated from the diameters of the high frequency and the high-to-medium frequency semicircles in the Nyquist plots for the electrodes are summarized in Table 1. The value of Rs for urchin-like MnO2 is 7.12Ω, while the value of Rs for caddice-clew-like MnO2 is 8.05Ω. Theoretically, the value of Rs for both Li/MnO2 cells should be the same as for the same electrolyte used here. The slight difference may be caused by the tiny difference in the battery package pressure by manual operation or the tiny difference in the amount of electrolyte added to the Li/MnO2 cells by manual operation. 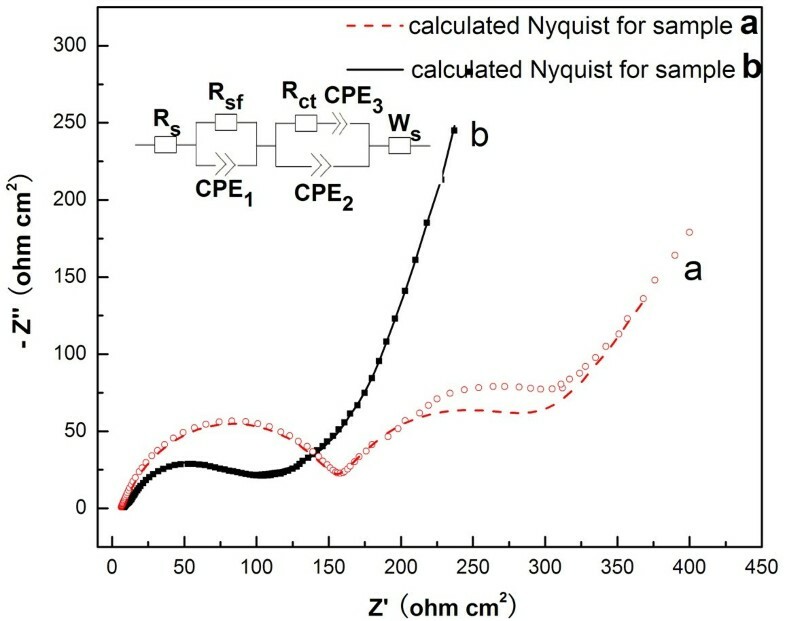 Considering the tiny difference in manual operation, the small difference of Rs is acceptable since the ohmic electrolyte resistances of the MnO2 micromaterials are similar. The Rsf and Rct of the urchin-like MnO2 are much lower than that of the caddice-clew-like MnO2. It proves that the Li-ion migration resistance through the SEI films and charge transfer resistance of the urchin-like MnO2 are much lower than that of the caddice-clew-like MnO2. Here, the influence of the tiny difference in the battery package pressure and the amount of electrolyte on the Rsf and Rct can be neglected. So, the urchin-like morphology is more favorable for lithium ion diffusion and transfer, and the reaction of MnO2 micromaterials with lithium ion is much easier. a, caddice-clew-like MnO2 sample; b, urchin-like MnO2 sample. In summary, two MnO2 micromaterials with urchin-like and caddice-clew-like morphologies are prepared by hydrothermal method. Both the crystalline phases are α-MnO2, which is essential to evaluate the relationship between electrochemical performances and morphologies of MnO2 crystals as anodes for lithium-ion battery application. Both the as-prepared α-MnO2 exhibit high initial specific capacity, but the discharge cycling stability is poor. Just in case of this research, the urchin-like MnO2 material has better electrochemical performance. The results suggest that different morphologies indeed have influence on electrochemical performances of MnO2 micromaterials in the application of lithium-ion battery. This study also gives us advice to make shell coating on the as-prepared MnO2 micromaterials to improve the cycling stability. This work was financially supported by the Program for Innovative Research Team (in Science and Technology) in the University of Yunnan Province (2010UY08, 2011UY09), Yunnan Provincial Innovation Team (2011HC008), the General Program of the Application and Basic Research Foundation of Yunnan Province (2013FZ080), the Youth Fund Research Project of Yunnan Minzu University (2012QN01), the Key Project of Scientific Research Foundation of the Educational Bureau of Yunnan Province (2013Z039), and the Graduate Program of Scientific Research Foundation of the Educational Bureau of Yunnan Province (2013J120C). The experiments and characterization presented in this work were carried out by LF, ZX, HZ, and YB. The experiments were designed by LF. The results of the experiments were discussed by LF, JG, CS, and XC. All authors read and approved the final manuscript.